For four years, Dawn-Marie Bass and her husband, Andy, prayed for the missing piece of their family. With a daughter adopted from India, and two biological children, the Bass family was certainly full, but they could not shake the sense that there was another child who belonged with them in Indiana. Dawn-Marie and Andy could picture their missing child – a boy around the age of their oldest son with a hearing loss. As an audiologist, Dawn knew her specific skills could help a child with hearing impairment, but after searching through many adoption channels, the Bass family had not found the child who was on their hearts. Jacob, on the day he was rescued from slavery. Photo by Shealah Craighead. It wasn’t until they heard from their friend, Jenny, about her recent trip to Africa that there was a new glimmer of hope. Jenny told Dawn-Marie and Andy about her experience at the Touch A Life Care Center in Ghana, and how she had met the three Jacobs – Big Jacob, Little Jacob, and Deaf Jacob. The moment they heard his name, the Bass’ knew that “Deaf Jacob” was the son they had in mind. Dawn-Marie immediately contacted Pam Cope, co-founder of Touch A Life, and asked about the adoption process for Jacob. Pam asked them for patience as paperwork was filed and the right timing could be arranged – since Touch A Life is not an adoption agency, the Basses had to work with Ghanaian organizations to get everything done in a compliant and timely fashion. 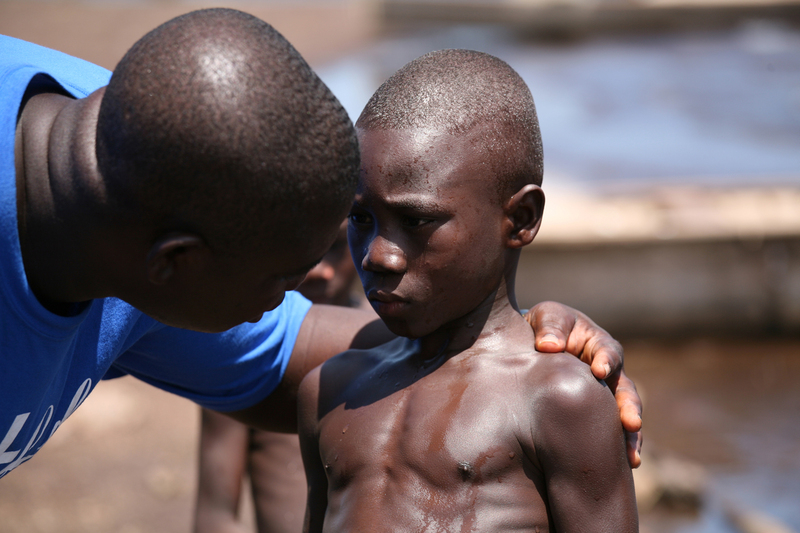 Jacob had recently been rescued from exploitative child labor by Ghanaian abolitionists, but as a child with a severe medical condition, it was possible to bring Jacob to the United States. 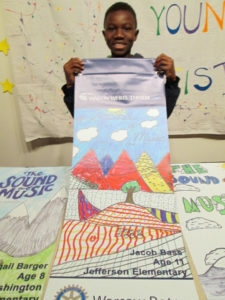 Jacob with his winning poster for the Wagon Wheel Theatre in Warsaw, IN. As it is with any new culture, food was a tough transition for Jacob at first. Dawn-Marie served chicken and rice at every meal until Jacob was comfortable with the American food his family ate. Now his favorite foods are cheese, pizza, spaghetti, hard-boiled eggs, and hot sauce! The Bass family has also been particular with which extra-curricular activities they choose, trying to stay away from a hectic, overloaded schedule. Jacob played on the elementary soccer team, and now is on the sixth grade wrestling team (ranked third in his conference!). 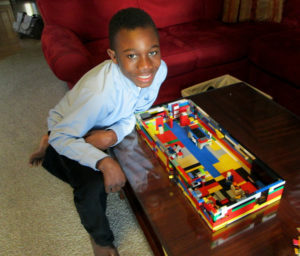 He is also a budding artist, building intricate Lego houses and inspiring his entire town by winning a local poster contest. Jacob with his latest Lego house. Jacob is our new Grandson. And what a blessing he has been to all of us. This young man has many gifts to give to this world, can’t wait to see it all happen. We thank God for him, he has given all of us, a gift of Love!